Charolais bulls met a good trade in Stirling on Tuesday 16 February at the breed’s official spring sale. Bidding peaked at 26,000gns, 14 lots traded at five figure sums and 123 lots sold to average £5960. Trade topper at 26,000gns was Goldies Jerry TI +65 SRI +61, an 18 month old by the homebred Goldies Formidable and out of a heifer going back to Blelack Blackberet. Bred and exhibited by Hamish Goldie, Ruthwell, Dumfriesshire, he was purchased by Messrs Boden and Davies, Mellor Cheshire. Carrying on his success Mr Goldie sold a string of 12 bulls to average of £9038 and the next highest priced was the reserve intermediate champion Goldies Jasper TI +60 SRI +58. This 19 month old is also sired by Formidable and went home to Berwick upon Tweed, Northumberland with J Watson who paid 23,000gns. From the same vendor was the August-2014 born Blelack Digger son Goldies Judge TI +76 SRI +71 at 9,000gns, this time selling to Ouston Farms, Gateshead, Tyne and Wear. Mr Goldie sold two more top priced lots, both at an 8,000gns price tag. First to purchase was Colin Davidson, Sandwick, Orkney, who took home the May-2014 born class winner Goldies Jet TI +56 SRI +53 sired by the 12,000gns Goldies Elation. Then the 20 month old Goldies Gladiator son Goldies Jubilation TI +57 SRI +54 was purchased by T Leslie, Shapinsay, Orkney for the same price. The class winner Elgin Jagger, a 16 month old by Blelack Blackberet caught the eye of W Milne, Strathdon, Aberdeenshire who paid 17,000gns to exhibitors Roy Milne and Sons, Elgin, Morayshire. The Milne’s went on to secure 13,500gns for the July-2014 born Elgin Jaguar a son of the 12,000gns Caylers Gladiator, this time purchased by JD Lindsay, By Kirriemuir, Angus. Junior Champion Newhouse Jupitur was next to sell at 16,000gns. Bred and exhibited by RM Adam and Son, the 19 month old Jupitur who is sired by the 30,000gns Silver Joss was purchased by Gilbert Crawford, Maghera, Co Londonderry. Two lots shared a 14,000gns bid. The first was the supreme champion Barnsford Jubilant and the judge Ben Harman backed his decision by taking him home to Chesham, Buckinghamshire. This 20 month old from Tom and Sheena Gatherer, Inchinnan, Renfrewshire is sired by the homebred Barnsford Gorse, a full brother to the 70,000gns Barnsford Ferny who was the first Charolais that the Gatherer’s had sold from their small herd of only seven cows. The day’s second 14,000gns call was made by J Wight and Sons, Midlock, Lanarkshire for Blelack Jerrylee, a 19 month old by the 15,000gns Goldies Dynamite from Neil Massie and Sons, Aboyne, Aberdeenshire, who went on to sell a further three bulls to an overall average of £7481. At 13,500gns was the class winning Balthayock Jackpot TI +48 SRI +62. J and M MacDonald, and Dunbeath Farms Limited both of Dunbeath, Caithness shared the purchase of this August-2014 born bull sired by the Highland Show class winner Ugie Echo and exhibited by David and Nick Walter, Balthayock, Perthshire. The Walters sold a total of 13 entries for an average of 5832. Next best was another Echo son at 13,000gns, the 19 month old Balthayock Jonathan TI +62 SRI +68 was purchased by Peter and Shelia Donger, Towcester, Northants. Two entries went to 12,000gns each. Elrick Jester, sired by the 16,000gns Stirling supreme champion Thrunton Fearless was the first. The May-2014 born Jester was jointly purchased by Jim Muirhead and JM Cant and Partners both from Arbroath, Angus, from exhibitor Michael Massie, Ellon, Aberdeenshire who sold a two more with a total average of £8155. The reserve junior champion also secured 12,000gns. The 17 month old Harestone Jackson is sired by the 25,000gns Inverlochy Ferdie and his gsire was Highland show supreme champion and breed champion at the Royal show. Jackson caught the eye of JH Wilson, Newry, Co Down and was bred and exhibited by Neil Barclay, Insch, Aberdeenshire. Mr Barclay went on to sell six more bulls at an average of £7650 including another Ferdie son, the 15 month old Harestone Jackass who was snapped up at 10,000gns by WJ Fraser and Sons, Ballindalloch, Banffshire. A bid of 11,000gns secured the class winner Thrunton Jetstream for JH Anderson, Fortrose, Ross-shire. This June-2014 born Thrunton Gladiator son was bred and exhibited by JHC Campbell and Sons, Alnwick, Northumberland, who also had a good day averaging nearly £6,000 a piece for six bulls. The day’s final five figure bid went to LA Richardson and Sons, Maguiresbridge, Co Fermanagh for their senior and reserve supreme champion Hillviewfarm Judge. J and G Smith, Stromness, Orkney secured this 21 month old son of the 25,000gns Perth supreme champion Mowbraypark Orlando for 10,000gns. Next at 8,500gns was the class winner, Clyth Jackthelad TI +63 SRI +60, a 16 month old Blelack Digger son from Ronnie Mackay, Lybster, Caithness selling to PM and PM Rhodes, Holme on Spalding Moor, Yorkshire. A final call of 8,000gns was paid for the May-2014 born Dundas Jackpot who was knocked down to CG Craig Farms Limited, Gateside, Fife. 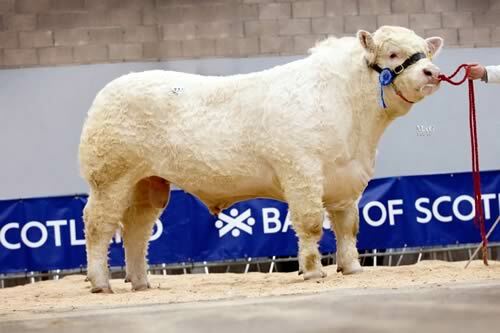 This son of the 14,000gns Highland show class winner Ugie Goldcup was exhibited by Mrs JM Gilchrist, Biggar, Lanarkshire. Females met a strong demand with 83% clearance and selling to 4,900gns for a mother and daughter pair from JA and MF McMillan, Brechin Angus. The 15,000gns Carlisle supreme champion Burradon Talisman daughter Dunesk Diana, a class winner at the Highland show and breed champion at Angus, was sold with her 12 month old daughter Dunesk Lulu. Lulu was last year’s Stars of the Future reserve junior champion and is sired by the 12,000gns Highland show senior beef breeder champion Brampton Albert. The team behind the money on the pair was E Hamilton and Partners, Strathaven, Lanarkshire. Two heifers sold for 4,000gns. The first was the class winning August-2014 born 18,000gns Derryharney Outstanding daughter Derryharney Jane who was purchased from Harold Stubbs and Andrew Burleigh, Lisnaskea, Co Fermanagh by C Smeaton and Son, Kirkbuddo, Angus. Then Hamish Goldie continued his success and secured the same amount for the 19 month old Goldies Jetty TI +71 SRI +68 by Goldies Formidable who was purchased by WG Johnson and Sons, Ripon, North Yorkshire. Rounding off the sale at 3,600gns was the reserve female champion also exhibited by Mr Goldie. This time going across the water to Clones, Co Monagahan, Eire with Harte Peat Limited. The April-2014 born Goldies Joy TI +63 SRI +52 is a daughter of the 14,000gns Perth intermediate champion Killadeas Legend.